MORGANTOWN, W.Va. – The WVU Cancer Institute officially dedicated its newly expanded facility during a ceremony held today (Oct. 18). West Virginia Gov. Jim Justice (far right) speaks to the crowd gathered for the dedication of the newly expanded WVU Cancer Institute Mary Babb Randolph Cancer Center. Clay B. Marsh, M.D., vice president and executive dean for WVU Health Sciences (front row, far left); WVU Cancer Institute patient and WVU Medicine employee Erin Dunmire (front row, second from left); Richard Goldberg, M.D., director of the WVU Cancer Institute (front row, fifth from left); and Albert L. Wright, Jr., president and CEO of the WVU Health System (front row, sixth from left), also spoke at the ceremony. The $13.2 million remodel includes 34,600 square feet of additional space, including an expanded pharmacy, eight new treatment rooms, 39 new exam rooms – a nearly 150 percent increase – nine procedure rooms, and two consult rooms. The ground floor lobby and registration area have been redesigned to meet the needs of patients and their guests, including areas with televisions and a quiet place to sit near a fireplace. 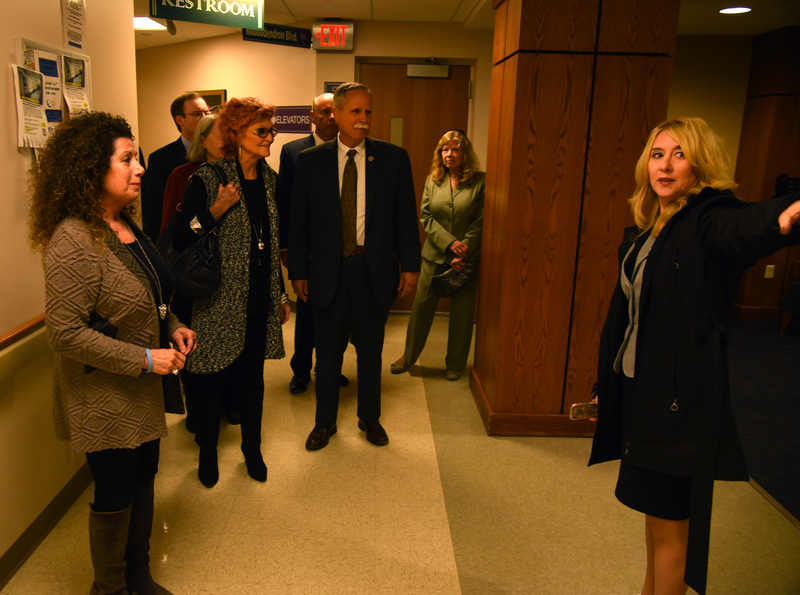 Deborah Falconi, director of oncology services at the WVU Cancer Institute's Mary Babb Randolph Cancer Center (far right), leads a tour through the newly expanded facility following the dedication ceremony. Clinic visits have increased by 27 percent at the WVU Cancer Institute Mary Babb Randolph Cancer Center in Morgantown compared to this time last year. 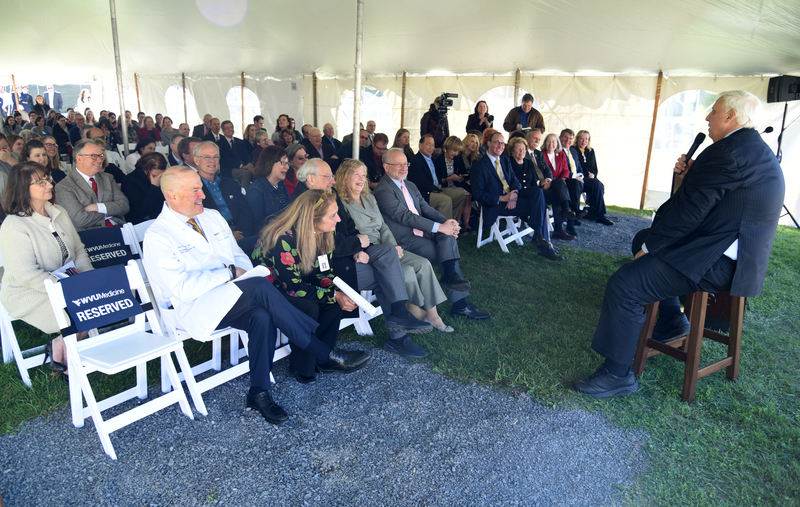 Cancer Institute and WVU Medicine leadership saw the need for additional providers and space to keep up with the growing demand. The Institute launched a major recruitment campaign to double its physician force, hiring 38 new physicians in more than a dozen subspecialties by 2020. In addition, the Institute is bringing in more than 100 advanced practice providers, clinical pharmacists, nurses, medical assistants, and other clinical staff to support the physicians. The recruitment effort focuses on addressing the biggest cancer needs in the state – especially breast, prostate, lung, and colorectal cancers – in addition to growing the Institute’s more exclusive programs, such as intraocular melanoma, sarcoma, head and neck cancer, brain tumor, and Mohs surgery. The facility has been put into immediate use as construction was completed, including the use of new offices and patient care areas. When the new space is fully staffed, as much as twice as many people will be able to seek cancer care here in the state. Many patients will be able to receive most of their care closer to home at one of the Institute’s growing number of regional centers.